People say that work does not seem like work anymore if you love what you do. However, passion is not enough to sustain a lifestyle. Everyone needs a financial backing to help them live life the way they deem fit. Thus, when it comes to selecting a career, people are always curious about how much they might earn out of it. For some, it is the only motivation in the morning to get up and go to work. People in the community service sector do not get paid as much. However, they do have a sense of accomplishment at the end of the day. Let’s find out how much a firefighter earns. 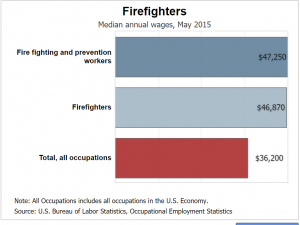 The mean annual income of a firefighter is around $49,000 with the median somewhere around $46,000. There are various factors that affect this number including the size of the population and the education that a firefighter has undergone. Below is a list of these factors and how they can increase or decrease your salary as a firefighter. The location of the fire department is a major factor in deciding someone’s salary. This is because of a few factors like – population size, availability of firemen and frequency of fighters. A place where spontaneous wildfires are likely, have a higher need for firemen than other locations. Currently, New York pays their firemen the most at about 70% above the national mean. On the other hand, Columbia pays the lowest at 38% below the national average. To be a firefighter, one usually just needs to have studied a course related to fire science in high school. However, education is highly valued in this field. There are two main reasons for this. One is that it is proof of your knowledge in the field. The second is that the government will have to spend considerably less on you to develop you as an asset. Thus, they can afford to pay you more. A bachelor’s degree or an associate’s degree in fire science will help you advance you career and earn quite a bit more. A master’s degree might help even more. Experience is usually a major key in deciding someone’s income. As a firefighter, your income can rise about 50% with experience in the field of 20 years. This is quite high when compared to other jobs which usually see a 15-20% rise in the same amount of time. As a fireman, you will need to know the basics of EMT to even apply for the job. However, you can choose to pursue the medical field a bit further and become a paramedic or get advanced EMT training. Having these credentials gives you a higher chance of earning more. It also gives you a “Plan B” if you do decide to change careers later. At the end of the day, your employer signs your paycheck. According to the Bureau of Labor Statistics, the highest paying employers for this job aren’t the government but private contractors. This includes companies that deal with waste management, coal and oil production, and metal product manufacturing. However, the local and the state government still hire the most number of firefighters. One of the best things about having a government job is that there a bunch of other benefits that come with it. As a firefighter, you obviously get perks like dental and medical insurance. But you also get covered sick leaves and reimbursement for some specific tuition fees. The exact benefits vary from department to department. As you can see, the financial scope of a fireman isn’t as good as that of a doctor. However, at the end of the day, you become a hero in someone’s eyes. So, if you want to be that hero, find out the requirements to become a firefighter now!